It’s easy to see through the guise of sophistication that money seems to shroud people in. That’s because, at their core, rich people are just children like the rest of us. They just have more time and money to play with, so they start doing things that children do like organizing their dream garages with collectible cars painted in their favorite colors and marked with their lucky numbers. All of that so that their precious rides can better fit the mold of the lives they dreamed when playing house. Sure, were generalizing here, but we’re certainly not judging the owner of these two precious machines that popped up for sale on the Bonhams auction block. How could we? It’s hard to argue against anyone who has a Porsche 911 R and 918 Spyder locked away in the same garage, especially so when they chose such striking colors to compliment. The two cars are meant for each other, and they’re being sold as a duo to keep some heartless soul from separating the two. Both cars are chassis number 290 of their respective models. 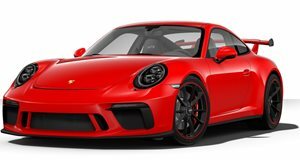 As if that wasn’t enough to hold some significance, there’s the fact that the owner ordered each Porsche with a contrasting dual color scheme. The 911 R uses an eye-popping shade of Acid Green as its primary color and features black accents strewn throughout the interior and exterior to bring some semblance of level-headedness into the picture. 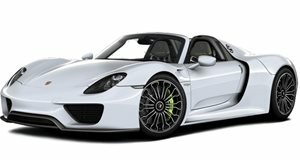 The 918 Spyder, on the other hand, uses that same shade of black as its primary color and compliments the 911 R only by using the Acid Green on its brake calipers. Given that the 918 Spyder has a kinetic energy recovery system that helps slow the hypercar while feeding juice into the hybrid system, those carbon ceramic brakes won’t be getting too much use and will preserve that color for quite a while. Not like they’ve gotten much use anyways. Like many collectors, this seller used their cars as pretty museum pieces—putting only 37 miles on the 911 R and hardly turning the 918 Spyder’s odometer past the 2,300 mile mark. We expect a pair of auction pieces like these to run into the young millions. If you have that kind of cash, now is your chance to save these cars and give them the hard life of being track day supercar humiliators like they were intended to be.